Are you looking for a good camera but have some budget constraints? 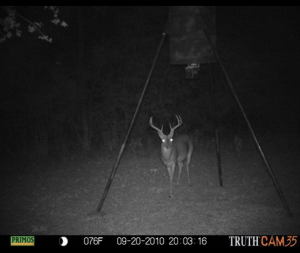 The Primos Truth Cam 35 might just be the trail camera for you. Don’t expect the best performance at this price though. This camera has the basic functions to get the job done, but lacks special features that are present in those high-end trail cameras. Fair enough, as you get what you pay for. The Primos Truth Cam 35 has a 3 MP resolution camera. This resolution gets you decent photos, definitely good enough to determine what wildlife is lurking in the area. Night photos tend to blur out, but still good enough to know what was captured. This camera is best used in an open field or area. This small camera comes in a black, reflective case. It looks like a mini-cambecause it has a slim profile which makes it fairly easy to carry around or hide in the trail. The battery life and storage is also pretty good with this model. Setup is incredibly easy, something which you don’t come across often in other game cameras. It is such a simple to use device, that you can take it out the box and have it taking pictures in a matter of minutes. No complicated manual to study for hours without end. Considering the low price tag, the daytime pictures are downright fantastic. I have seen similar quality pictures in trail cameras over $100. Batteries last well if using image mode instead of video mode, and although it states that only 8GB memory cards are supported, I know of at least two people using 16GB memory cards without any issues. Some pics whiteout under heavy canopy. To be honest, this is often the case with more expensive trail cams as well. There are some users that have reported problems with this Primos device, but most seem to have cleared it up with the customer support division. Night time images are not as sharp as daytime images, and some blurring can occur. For less than a hundred bucks, you can own the Primos Truth Cam 35. Although it does not have many features, it has the necessary functions to allow you to take photos of the wild. Play to the strengths of this camera and make the most out of the price you pay. If you need a camera with more special features, I suggest you visit the trail camera buying guide.